Ok I have been absent for a little while, I have been cooking and taking pictures but just got into politics and maybe a little lazy. Ok mostly a little lazy. I am still on the fend for yourself diet so a lot of what I make is spur of the moment, open the Frig and see what’s in there. We did buy a new crock pot, do they still call them that? I did a quick beef stew in a red wine gravy which came out great but that’s another post to come. About 1 lbs. of pork cutlet pounded then diced 1/8 to ¼” or smaller. If you partially freeze the cutlet it is so much easier to dice or mince. 1 small onion 1 diced about 1/3 cup. 1/3 cup finely pan toasted pine nuts. 1 ½ to 2 Tbsp. Hoisin sauce. Romaine, Iceburg or Boston Bib Lettuce I suggest the Bib lettuce it wraps better. However, this was a spur of the moment meal. YA use what you’ve got. In large skillet or WOK, heat the peanut oil until shimmering. Add the pork and stir fry over high heat until just cooked through about 3-5 minutes depending on the dice size. Use slotted spoon to remove the pork and put aside. 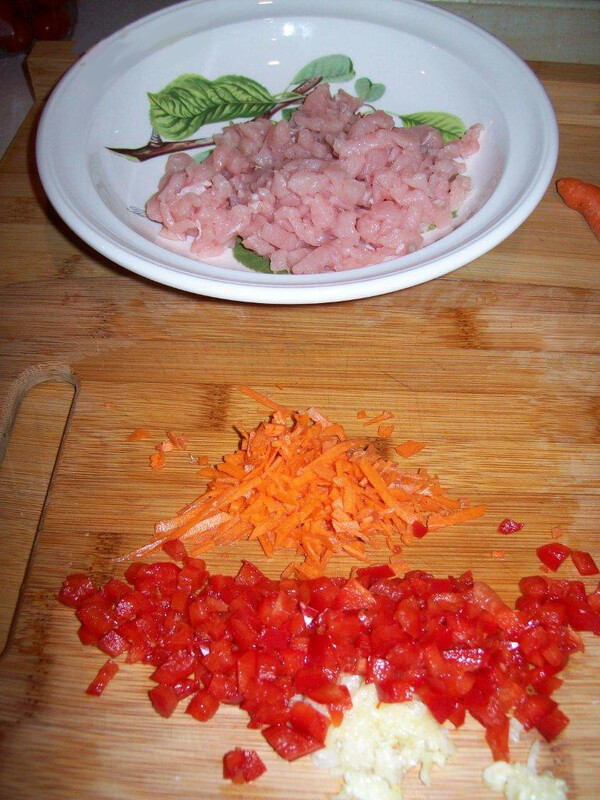 Add the onion, carrot and red bell pepper to the skillet cook over medium or slightly lower heat until soften about 2-4 minutes. Stir in the pine nuts, and Hoisin sauce. Return the pork to pan stirring to coat evenly about 1 minute. Spoon the mixture into lettuce leaves for wrapping. Hint, you may have to remove pan from heat if it is too hot so it does not thicken up too much. You can always add a touch of chicken broth or water in needed but you want it semi thick not watery. I served with Lyn’s homemade ginger pickled cucumbers on a bed of wide sliced carrots, now if she would only tell me how I could post. 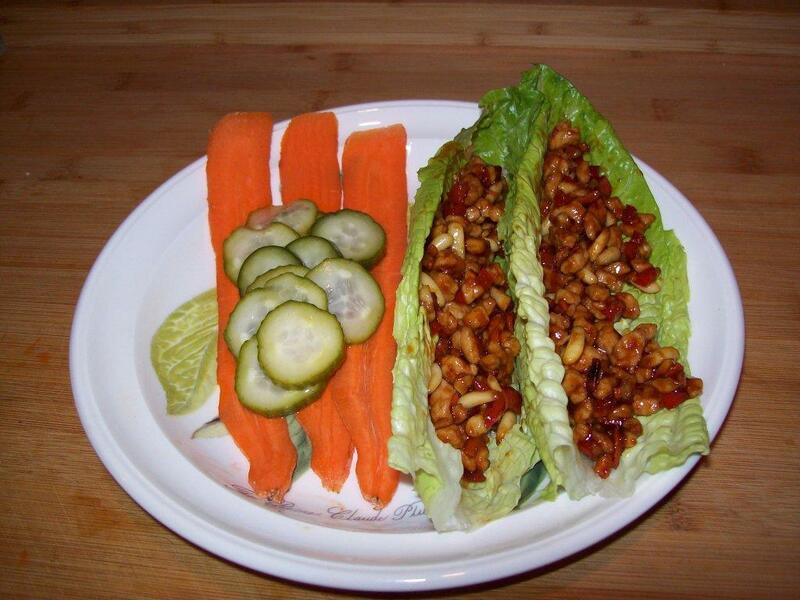 Lettuce wraps are very easy to create with an almost endless array of ingredient variations. You can also use the same ingredients that you use in burritos, tortillas, pita bread, or spring rolls. Jut let your imagination and taste buds be your guide. They key to great wraps is the contrast of warm, flavorful fillings with the cool crunch of lettuce. For a party, offer a variety of lettuces and a variety of fillings such as cold chicken salad, grilled beef teriyaki strips, Italian sausage, onions, shredded cheese, and water chestnuts. Iceberg is the most common lettuce used, but the wide, strong leaves of romaine, red leaf, or slightly bitter escarole offer surprising changes of pace. For best results, pick the largest, most pliable lettuce leaves. types to use are iceberg, red lettuce, radicchio and/or large spinach leaves. Dry lettuce well before using in the wraps. 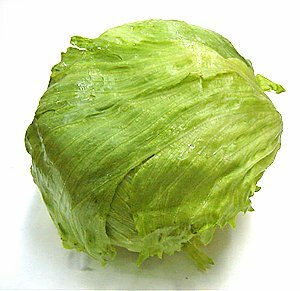 To keep iceberg lettuce crisp, cut the core out. Fill the core with cold tap water, then drain for 15 minutes. It will stay crisp for up to two weeks in the refrigerator. This entry was posted in Information, Meat, Pork and tagged cutlets, Hoisin sauce, Lettuce, Peanut Oil, Pine nuts, pork, WOK, Wraps. Bookmark the permalink. Kroger has some pre made turkey cheeseburgers that are actually truly excellent. They are pre veteran kroger brand name. I simply put them in a skillet with a little water so they do not stick as well as cook them till they are brown. I was really suprised at how good they were ! !